There will be a KITTYROBOT exhibition held at Omotesando Museum on B3F. The theme of this exhibition is "Messenger of the Future" educating little kids to take care of the future and the fusion of Hello Kitty and a robot is a symbol for the future. 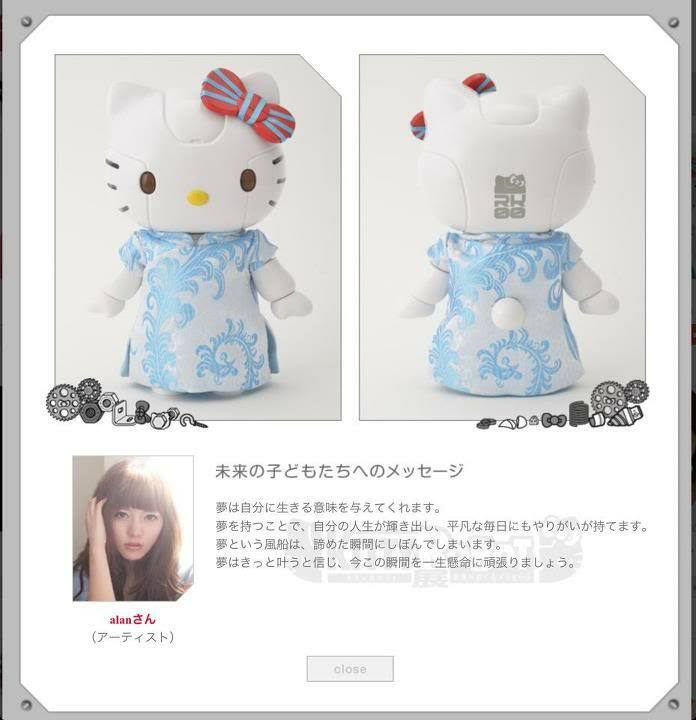 Many celebrities have designed a KITTYROBOT and they will be at the exhibit. Dreams can bring more meaning to life. A life with dreams is more splendid. Dreams are like a balloon because when you give up, the balloon deflates. Dreams will come true, so for that moment, you need to work hard now. Added alan's KITTYROBOT and message to the first post! Some Hello Kitty designs are creepy... O_O but others are cool! Alan's is cute! Dammit! The bid on alan's kittyrobot was ~$200USD. I tried to bid for it, and I was winning, then some person comes in and bids over me pushing it to ~$690USD. Who are you? Are you on this forum??? I was like 'YES! MUST BUY' and then I saw the price... HAHAHAHA. NO.